Abstract: Reclaiming land from the sea is not a new concept in China. Since the founding of the People’s Republic of China, there have been three or four significant upsurges in land reclamation projects. From the South China Sea to the East China Sea, from the Yellow Sea to the Bohai Sea, China’s 18,000 kilometers of coastline experience daily the accelerating drama of land reclamation. 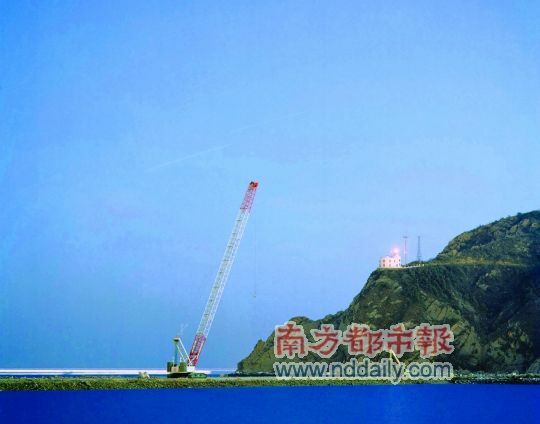 Reclamation of large land areas near the Huangbaiju lighthouse in Dalian was underway in February 2011. China’s coastline receded almost 2000 kilometers between 1949 and 2010, and more than half of China’s coastal wetlands were lost. The reclamation of land from the sea is not a new concept in China. Since the founding of the People’s Republic of China, there have been three or four significant upsurges in land reclamation projects. From the South China Sea to the East China Sea, from the Yellow Sea to the Bohai Sea, China’s 18,000 kilometers of coastline experience daily the accelerating drama of land reclamation. The 11th Five Year Plan called for the reclamation of 700 square kilometers of land each year, an annual increase that is equivalent to the area of Singapore. However, increasing coastal land through reclamation also makes islands, extant coast, and coastal wetlands disappear. The loss of these areas could wipe out native species and increase marine pollution; ultimately, the reclamation process make marine disasters more frequent. Caofeidian reclaimed an area equivalent to 13 Macaus in just four years. The area of reclaimed land is growing every day. 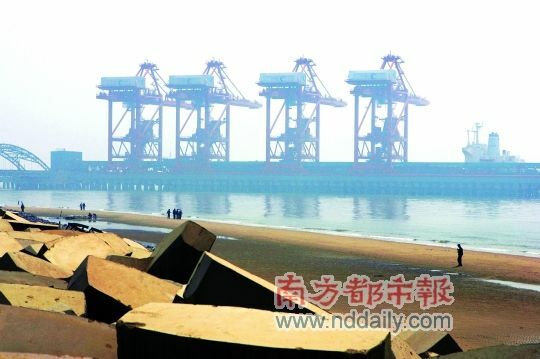 Despite the popularity of reclamation during the first three years of the Caofeidian project, people are not pleased that sand continues to blow while more land continues to be reclaimed. Caofeidian used to be a small sand island 18 kilometers from shore. More than 1,400 years ago, the Emperor Tang Tai Zhong captained a fleet that passed near the island. One of the Emperor’s favorite concubines, called Cao, died of illness during the journey and was buried on Caofeidian. After her burial the island remained mostly untouched in its natural state. However, later explorers discovered that the island’s geography was suitable for the construction of a large deepwater port, which promised to be very lucrative. In 2003 after the opening of the Tang Cao highway, which connects Tangshan and Caofeidian, there was an upsurge in development on the island. Billions of dollars were spent constructing the new port. Last July, Hebei Mining and Steel Group brought 20 million tons of ore to Caofeidian to make up for a lack of sand in the area. In just a few years the ocean has receded and large tracts of land "grew" where the sea had once been. A lighthouse, built in 2006, now sits deserted, surrounded by large tracts of land on all sides, oblivious to the ebb and flow of the tide. These new tracts of land do not even have names. During the reclamation process, the land acquired from each dried kilometer was labeled numerically and sequentially: 1+, 2+, 3+, etc. Many of these new land tracts are still referred to by their initial engineering coordinates. A contractor on the island estimated that Caofeidian land reclamation has produced in total a landmass that is 18 kilometers long and 16 kilometers and which surrounds the island. This landmass is roughly 13 times the size of Macau. Situated on the northern shore of Bohai Bay, in Eastern Hebei, the new area of Caofeidian is an important engine for the economic growth in China's Bohai economic zone. New Caofeidian is also one of the key construction projects from the 11th Five Year Plan. According to a city-level deputy, this new area is slated to encompass an area 1,943.72 square kilometers ultimately, and large amounts of resources are being spent on the land reclamation. According to existing plans, this new area will reclaim 487 square kilometers by 2020, including tidal flats, salt marshes, and coastal aquaculture land. This number represents 77.3 percent of the usable land area in the new Caofeidian. According to Fan Fengyu, the vice president of the Yangtze and Yellow Corporation, reclamation is very common in China, and has been mainly centralized in Tianjin, Liaoning, Jiangsu, Shanghai and Guangdong. Fan estimates that between 2002 and 2010 China’s total area of reclaimed land increased from 2033 to 13598.74 hectares, which means that reclamation activity increased by a factor of six or seven. Since the founding of the People’s Republic of China, the government has frequently pursued land reclamation projects. The reclamation during the ‘40s and ‘50s was mostly aimed at sea salt production. During the ‘60s and ‘70s coastal cities reclaimed land to expand agricultural cultivation. Later, during the 80s and 90s, tidal flats were reclaimed again, this time in order to establish fish farms on the waters’ edge. After 2003, coastal cities began to enclose tideland once more for development of industrial zones, chemical industries and coastal tourism. Previous upsurges aside, it is undeniable that a new round of national reclamation is now underway. According to a marine scholar, China’s total reclaimed area increased at the speed of 230 or 240 square kilometers per year between 1949 and 2000, reaching a total area of 12,000 square kilometers by the end of the millennium. During the 10th Five Year Plan period, annual reclamation increased to nearly 300 square kilometers, and even this is not the end of it. For the period of the 11th Five Year Plan, the government decided to expand land reclamation to 700 square kilometers per year – a landmass the size of Singapore reclaimed annually. Reclamation projects can be found almost everywhere in China from the South China Sea in the North to the East Sea and also the Yellow Sea and Bohai Bay. The Yangtze River Delta, the Pearl River Delta, Laizhou Bay in Liaoning and Shandong’s Jiaozhou Bay are also affected by land reclamation. "You can see the reclamation all around, from Liaoning to Hebei, Tianjin and even in Hainan." A photographer shooting a lighthouse along the coastline said that all Chinese coastlines were now in trouble. A 2002 National Bureau of Oceanography study revealed that China’s top three provinces, in terms of total land area reclaimed, are: Jiangsu, 98283.96 square kilometers; Fujian, 72369.25 square kilometers; and Shanghai, 14832.19 square kilometers. The impetus for reclamation projects is that there is not enough available land for the pressure of development. China aims to develop its economy rapidly, but the government discourages the development of existing farmland by attaching a fee to the destruction of cultivated land. Therefore, it is financially more feasible to build on reclaimed land. The cost of reclamation is about 20 million yuan per acre, but reclaimed land can be sold to developers for at least 500 million yuan per acre. In economic terms there is no downside to such a lucrative investment for the government. A prominent real estate company calculated the cost of reclamation to be between 130,000 and 190,000 yuan per mu. The government can then sell reclaimed land for about 200,000-330,000 yuan per mu, and developed properties on the coast have the potential to turn enormous profits. Housing built on reclaimed land in a Hainan residential area holds the national record for expensive housing: 10 million yuan per square meter. In 2009, the North Sea branch of the State Oceanic Administration (SOA) acknowledged publically that much of the land reclamation around Bohai Bay was illegal. In Caofeidian alone, an investigation found 10 cases of illegal reclamation. According to the Marine Environmental Protection Law and Sea Area Use Law, reclamation projects over 50 hectares require government approval. However, some projects have been able to illegally circumvent the regulatory process. Professor Wang from Peking University stated that he was very surprised to find that hundreds and even thousands of hectares of land were reclaimed without government approval. The SOA staff confessed that before 2002, there was no system to manage the reclamation, and even after reclamation laws were established they was still very difficult to enforce. Even the Haida case, which was the first court case involving reclamation in China, has not produced significant changes until recently. On November 28, 2003, the Shandong Weihai Rongcheng Haida Shipbuilding Co., Ltd. received a judgment from the SOA demanding that they "return the land that it illegally occupied, and restore the area to its former state of ocean”. The Company was given a warning in addition to a 513,180 Yuan fine. Haida refuted the judgment, claiming that their reclamation project had received approval from the RongCheng Planning Commission. Furthermore, their project was implemented before the Sea Area Use Management Law was enacted, so Haida felt that punishment from the SOA was unwarranted. A representative from the Oceanic Administration responded that “Haida has been expanding its reclamation [since the Law of Territorial Waters was passed]. Last year Haida had 39 reclaimed mu, measured on June 5. By August 18 the reclaimed area had grown to 57.02 mu, as measured by China’s North Marine Surveillance Corps.” In September of that year, Haida lost the case but refused to accept the final ruling and appealed to the Beijing High Court. On December 15, 2004, the Beijing High Court rejected Haida’s appeal. After this first reclamation case in China, reclamation operations in coastal provinces have become more frequent, and almost none of them adhere to legal control. Officials in the National Bureau of Oceanography indicated that companies ignored the typical “three no” test: they held no planning discussion with government officials; they conducted no marine environmental impact assessment; and they held no legal certificate of permission to fill the ocean. Thus, much of the ocean area reclaimed by these companies has not been approved. Last year, during the inspection of the Jingtang reclamation project, the Tangshan Branch of China Marine Surveillance found that the actual reclaimed area had exceeded the approved area by 107.22 mu. While the initial environmental impact assessment showed that the reclaimed area of the Haihang Group’s artificial island project would be 29 mu, the certificate issued by Hainan province authorized 49.2968 hectares for reclamation. By the time the project opened for customer bidding, the reclaimed area had increased to 197 hectares. National regulations require payment of 30,000 RMB per mu of ocean reclaimed. After the Law of Territorial Waters was enacted, the fees collected by the National Bureau of Oceanography increased from, 7,821,750,000 RMB in 2010 to 178,927,000 RMB in 2004. Each year in August, fishermen on the coast of the Bohai Sea collect jellyfish. Watching from the prow of his ship as workers handled jellyfish, Captain Liu sighed, “seven or eight years ago, we would fill the ship’s hold with jellyfish, even if we were fishing close to Caofeidian. Now we can only collect half that amount on most days, even if we go out 10-20 miles beyond Caofeidian.” He complained that after reclamation, the sea became dirtier and the fish more scarce. Since most land reclamation has taken place in bays, like Caofeidian, much of the coastline has been abnormally straightened. As the seawater retreats, the former coastal beaches are replaced by land almost overnight and water quality near the near the reclamation sites continues to deteriorate rapidly. According to a 2010 statistic published in a China Land article entitled “Land reclamation, Luck? Misfortune?”, the length of China’s coastline has shrunk by 2000 kilometers since 1949. Wetlands along the coast decreased by more than half. Jiaozhou Bay, the area that has seen the most reclamation, retreated by 35 percent between 1928 and 2005. And the Bohai Bay coastline retreated to 5139 kilometers in 2000, posting a loss of 260 kilometers. In addition, the island coastline in Zhejiang retreated by 200 kilometers, Guangdong by 300, Liaoning by 48, Heibei by 60, and Fujian by 83. Wetlands are also disappearing as a result of reclamation. Last summer, Ren Zengying, an environmental volunteer from the Bird Watching Association, found that the wetlands in the Yellow River Delta, which were once a crane migration site, have been replaced by chemical factories and industrial parks. Last year the National Bureau of Oceanography tested the ocean water in the new area of Tianjin Binhai and found that reclaimed area is increasing and the wetlands are decreasing; the coastal water quality is quite low, with inorganic nitrogen and active phosphates as the main pollutants. The biomass and diversity index of the coastal water is low, and marine shellfish are exposed to contamination by lead, cadmium and DDT. Another serious problem is the overabundance of nutrients, which can support algae overgrowth. Xia Qing, vice president of China Central ASTR, identified three major problems inherent in land reclamation: “The first problem is an inability to protect the new coast from, storms, waves and other natural disasters. The second issue is that the ecosystems connecting the land and sea are destroyed when rivers running to the oceans are blocked or rerouted. The third risk is that changing the ocean current can affect the reproduction of marine life.” Echoing most environmental experts, Qing claimed that “it is better not to tamper with the natural ocean environment.” Even though storms and flooding are not very likely, their effects can be disastrous. Holland is one of the only countries that has successfully reclaimed land from the ocean. However, a few years ago, the ocean took its revenge and ten percent of the country’s farmland was re-submerged. “We must be prudent when reclaiming land”, said an expert. During the past 100 years, Macao has only reclaimed 20 square kilometers of land. The same is true in Hong Kong, where a land shortage has created great tension. To beautify the new land in Caofeidian, people have planted many field poppies, or papaver rhoeas, which now cover the huge empty spaces. In a car driving along the 18 kilometer Tang-Cao highway, the GPS still depicts these coordinates as in the ocean. It is a mystery whether or not the few seagulls that fly overhead recognize their former homeland.